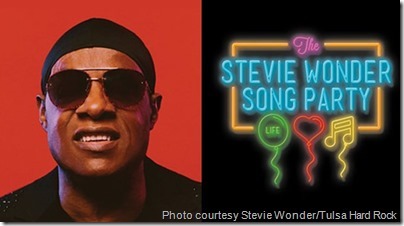 Inducted into the Rock and Roll Hall of Fame alongside The Rolling Stones, Otis Redding, The Temptations and others back in 1989, Stevie Wonder continues to impress a fiercely loyal, yet-to-diminish fan base. Proof of Wonder’s music-based magic could be heard and seen at the first of two sold-out concerts Nov. 2 at the Joint inside the Tulsa Hard Rock in Tulsa, Okla. Accompanied by an 11-piece band of men and women, Wonder dove into a well-paced set that allowed the insertion of “Spiritual Walkers” and an impressive merging of “All I Do/Overjoyed.” For the funk-soaked “Master Blaster,” Wonder’s fingers and thumbs worked the keys of a synthesizer in high fashion. These notes squawked and talked in time to the song’s swaggering beat, keeping audience members moving and smiling. Arriving early to please die-hards and casual listeners alike was “Higher Ground,” a driving number full of rock-style grit and Motown groove that was covered by Red Hot Chili Peppers in 1989. Wonder effortlessly reclaimed the song as his own in Tulsa, his voice every bit as urgent and astounding at that moment as it was on the studio original some four a half decades ago. Unfortunately, a handful of flimsy moments crept into Wonder’s concert. Some of the musicians spent the bulk of the first song, “As If You Read My Mind,” staring at and mouthing instructions to off-stage crew members to adjust the sound. The guitar was virtually buried in the mix for the first half of the gig, although the adventurous, top-tier playing of bassist Nate Watts helped overshadow the temporary lack of six-string sounds. There seems to be very little that Watts can’t play. Some fans did act slightly puzzled when Wonder halted the proceedings about 30 minutes into the performance to, in his own words, “warm up” his voice into the microphone while his fingers worked mini-miracles on his piano. He then apologized to the audience for the first song — it really wasn’t that horrendous, which made Wonder’s apology almost a shock — before he and his band bounced back bravely with an immaculate take of “Sir Duke.” An infectious, dancefloor-friendly number from Wonder’s 1976 “Songs in the Key of Life” LP that will be sonic gold until the end of eternity, “Sir Duke” gained extra life and punch on that Tulsa stage. As the horn patters and dancing high-hat sounds created a joyous sound of swirl in the P.A., Wonder sang “You can feel it all over … You can feel it all over” in a splendid, worry-free voice. And the multi-racial audience members did feel it all over. Wonder’s concert that night didn’t reach the majestic heights of his four-hour show in North Little Rock back in late 2015, but the Tulsa show was an event that, warts and all, infused witnesses with fun-loving vibes. Wonder’s appearance in Tulsa also was a reminder of the power — and the indisputable importance — of music.